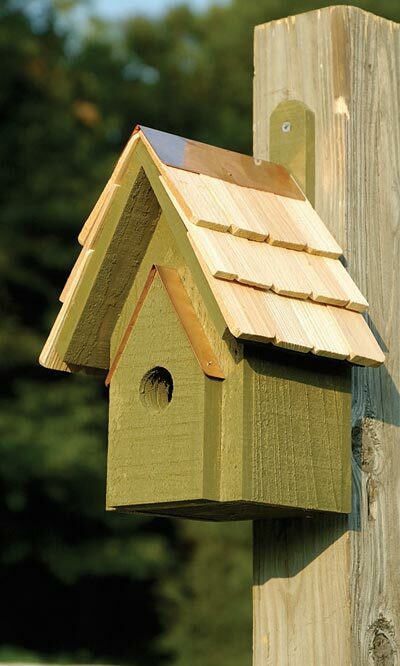 Bring vibrant color and traditional shape to your bird garden with the Heartwood Pinion Green New Classic Bird House. This durable, timeless home will be a welcome addition to any birding sanctuary, and its bold, dark green color enhances the setting. The square, all cypress body creates a comfortable shelter for an avian family, and a 1.25" diameter entry hole at the front enables them to reach the interior. A pitched roof covers this nesting area, and its hand applied cypress shingles further the traditional motif. Its overhang protects the interior from rain, while drainage at the base helps the nest stay dry. Copper flashing along the roof ridge and above the extended door panel adds style, and a copper disc on the back of the unit removes for nest checks and seasonal cleaning. Lasting cypress construction keeps the interior of the piece nicely insulated, while remaining durable and usable for many seasons. A mounting tab at the back of the unit makes it simple to attach to a tree, fence, or post in moments, and the dark green finish provides a fun hint. Continue the timeless hobby of birding in your backyard with this Pinion Green New Classic Bird House. Made in the USA.